Skyrunnig is a very young sport in the country! 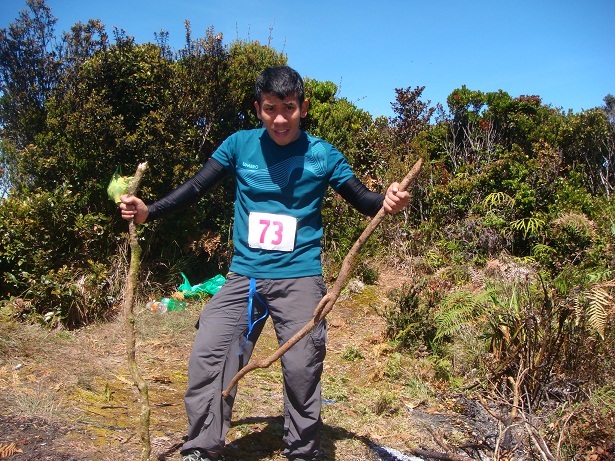 For a run to be considered a skyrun, the maximum altitude in the race should be at least 2000masl. 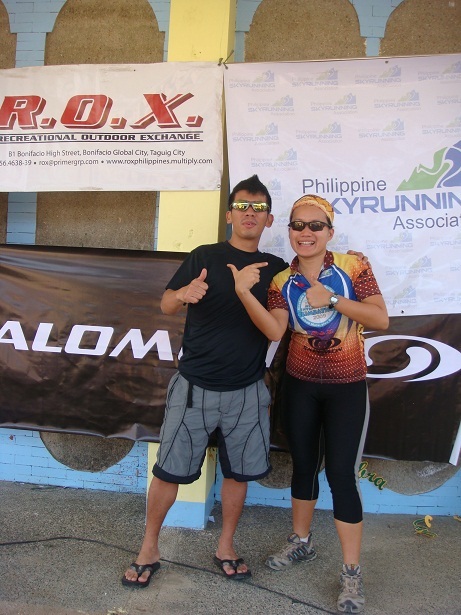 Right now, the Philippine Skyrunning Association is spearheading the promotion of the sport in the country! 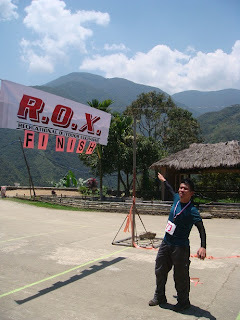 Last Saturday (April 16), I joined a race for the first time in my life. It was the 2nd Annual Hungduan Climbathon. I learned about the race just five days before the event. 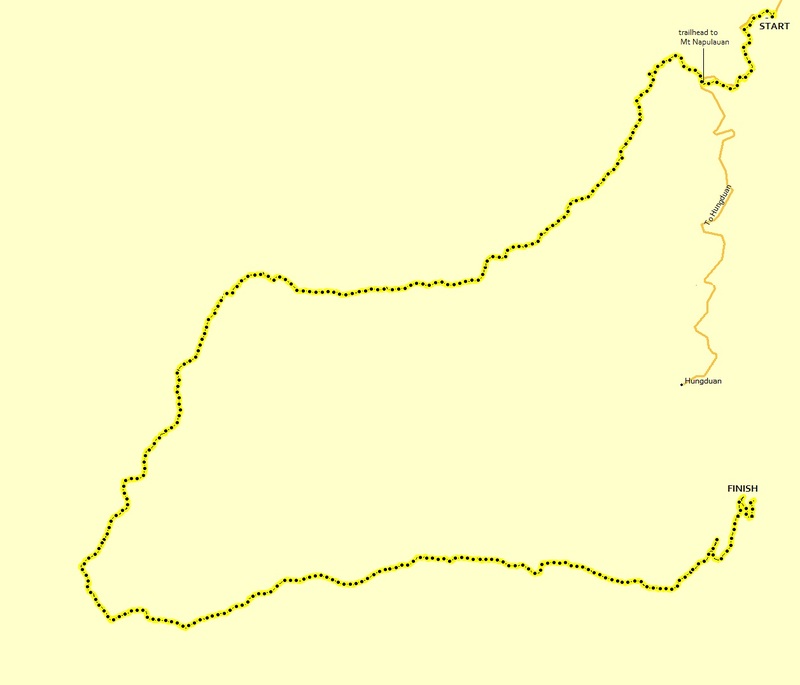 It said it would cover 21km of mountain terrain in Hungduan and I had just come home from a 21km traverse hike in Mt Arayat (April 10)! 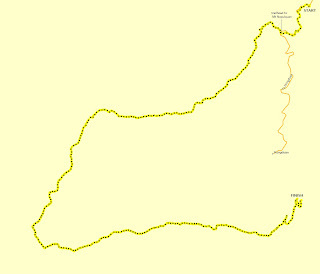 April 12 I had to go on my tri-weekly run in UP and I got my right calf and left foot injured. With the help of my physical therapist friend my left foot was fixed but I could still feel some pain in my right calf on the day of the climbathon. But the show must go on as they say! 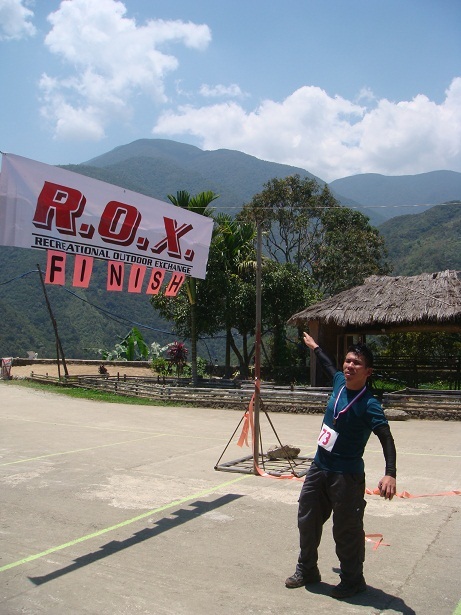 And at Hungduan, it came to me as a surprise that the race would be held in Mt Napulauan. This mountain had always been one of my dream climbs in the country. The mountain has lush vegetation evident in the mossy trunks of the bonsai trees that cover the mountain. The jump-off itself, Hungduan and the Hapao Rice Terraces is already a destination in your journey! 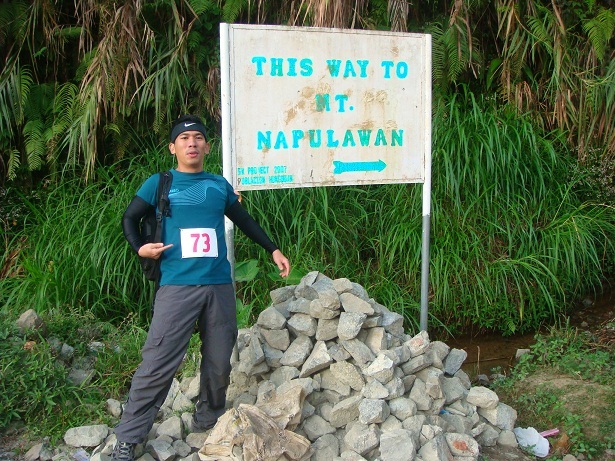 The first phase of the race was a 1.5k run on a dirt road to avoid a bottleneck situation at the entry into Mt Napulauan. There were ten local racers (male and female) and 17 non-local runners. At GO, everybody ran except me! I walked leisurely behind with the organizers, one of whom was JC Pineda, my blockmate back in my BS Applied Physics days in UP. At the trailhead to Mt Napulauan I was the last (27th) racer to commence the uphill trek. And this was the time I showed ‘em what I got. At the risk of sounding arrogant, I can say I am a strong uphill trekker, even stronger when I am not injured! It felt good to keep counting as I went up! I managed to overtake 3 locals and 13 non-local racers. The last person I overtook was a marathoner from Manila who belongs to the 40-and-above age bracket! That was already around 7500 feet above sea level. Just about a thousand feet to the summit! At that point, I only had three non-local racers to overtake, two of whom were champion adventure racers Marcelo Bautista and Thumbie Remigio who finished 2nd and 5th respectively. After I managed to establish a safe 100-meter distance between me and the old guy, I caught sight of two female local racers and one more racer from Manila. I decided to climb faster because I had the maximum momentum that time. My momentum increases whenever my nasty trekking technique succeeds. I pressure the climbers ahead of me by thumping behind them for a while as if saying “Hey can’t you get any faster?” When they start panting, I overtake them! Moreover, my handheld GPS device told me it was only less than a thousand feet to the summit and I expected everybody to be really fast downhill runners! In my effort to catch up with the racers ahead of me, I slipped and my injured calf got cramped! Damn! I remained at the spot where I got injured, resting and stretching for more than thirty minutes as four of the climbers I had overtaken stopped by to offer assistance. It was a rule in the race to stop and offer help when you come across an injured racer. But I didn’t want to hold them up so I always told them “Cramps lang to! Kelangan lang ng konting pahinga…una na kayo ser!”. One of them was kind enough to give me Hydrite tablets. That was my best spot in the race—11th. With Divine intervention, I found two sticks on the trail which I used as I dragged my right leg up to the summit which was very elusive. You’d think one three-sixty-degree spot was the summit only to know that you’d still have to trek to another bogus summit. 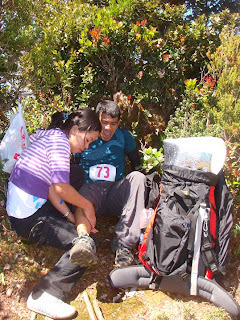 At the summit, a medic massaged my cramped calf for thirty minutes and she told me to really slow down on my descent. I had to because my leg wouldn’t let me run! But when three racers ran past me, I had to gather all my adrenaline and courage. I decided to increase my speed and before I knew it, I was running downhill as if I was skiing with two sticks! I managed to overtake two climbers on the way down and I finished the race in a little above six hours and with a very painful right calf! After the race, the participants became friendlier to each other and everyone had his story to share! And each story was flavored with sense of fulfillment and a promise to race again! They were a bunch of cool (and smart might I add) experienced racers and climbers. Some of them have experienced alpine altitudes like Kilimanjaro and most of them have raced in the TNF100 and the annual Kota Kinabalu International Climbathon. It felt good to be in a group of serious and healthy racers—a little shift from the smokers and drinkers in the local mountaineering community that I sometimes climb with. That day, I didn’t see anybody smoke! But don’t let this line discourage you! You can also do it! As I have previously mentioned in this blog, I am just an average Joe trying to test my limits and learning more from LIFE! Enjoy LIFE! Climb HIGH! Run the SKIES! See you in the next Skyrun! ur d best sir!! two thumbs up..
i'm one of those you overtake on the way down. But I overtook you again when you got lost hehe. i wanna try this just for the heck of it. parang fun skyrun, meron bang ganun? hahaha! nice.naka attend ka pala dito ser . aprub! Wala pang skyrunning sa Pinas noong nakita ko yung Japanese trail runs. Aray, masakit ma-sprain pag maling step. OA ako sa pain. Thumbs up ako sa matataas ang pain tolerance.